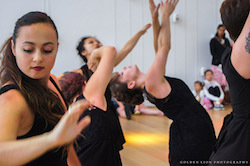 KAIROS Dance Theater at the Isabella Stewart Gardner Museum. Photo by Golden Lion Photography. Isabella Stewart Gardner Museum, Boston, Massachusetts. Part of artistic modernism is a chipping away at – even, sometimes, a knocking down of – the walls betweens the worlds of separate art forms. 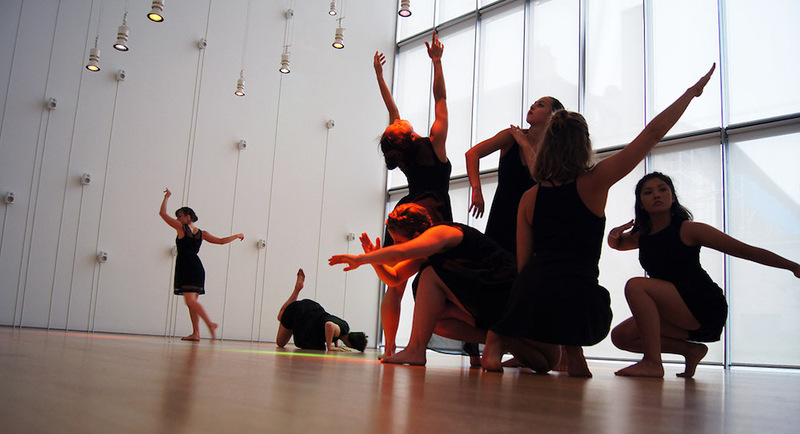 Between visual art and dance, for instance, dance performances in art galleries and museums are increasingly common. This unity seems, in some way, intuitive; is not dance also “visual”? The trend furthers the questioning of audience and artist roles, actions and qualities, as well as where art can occur – all also within modern art. This broad complexity was within KAIROS Dance Theater’s recent performances (several throughout the day) of STOCKS & BONDS at the Isabella Stewart Gardner Museum within Phillipe Rahm’s Sublimated Music sound installation exhibit (as part of the Listen Hear: The Art of Sound exhibit). At the same time, complexity aside, the convergence of visual, auditory and kinesthetic aspects came together to offer a simply beautiful and compelling aesthetic experience. The dancers began with their hands behind their back, wrists crossed. A unique positioning, with a closedness at the crossing but an openness through the chest. They started to move with a blend of angular and circular movement – elbows bending, swooping of hips and torso that matched circles of varied colors on the ground. Black empire dresses (with a fully female cast) played off all of that color in intriguing contrast. They all moved within their unique signature, each holding to the kinesthetically innate truth of that for herself. It was evident that the movement grew from an improvisational structure, and the dancers made intuitive choices that were true to their body. This illustrates a wonderful demonstration of a change in the character of dancers with the onset of modernism (and even within classical forms today); rather than shaped into “cookie-cutter” perfection, they are allowed, and furthermore urged, to embrace their own individuality as artists and as people. There was unity as well, however; their group seemed to be a garden or forest put in fast-forward videography, as if in a nature documentary, to show growth over months and years. Limbs branched, swooped and swayed in plant-like fashion – all continuous and fluid, with some angularity and accenting interspersed. The performance space was a sound installation, and the movement harmoniously echoed the qualities of the music, in which all in the room were immersed. Signature movements evolved, dancers sharing and following in them, such as bending elbows and hands falling to shoulders with upward gaze. Their placement in the space seemed stationary, dancers moving in their own kinesphere, until one might observe that they shifted slightly closer to the center of the room, ever so slowly and subtly. More animation came with two dancers, unexpectedly enough, creeping away from the group. They moved with both grace and strength. Extensions were smooth and sweet, yet powerful; grounding into the floor was fluid, yet rooted. Movements from ballet vocabulary, such as bourrées and petit allegro, were gracefully interwoven. It offered a grace and lightness to the overall diverse and nuanced movement. Even more petit allegro could have potentially added explorative possibility on the strong and quick side of things. One dancer re-joined the group for a time, then came back to her duet partner. Of all the movers, she seemed to consciously and actively embrace the most autonomy. 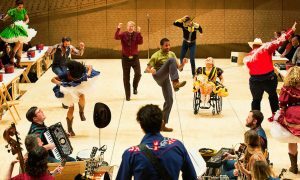 All of the dancers shaped the space with daring and skill, executing a phrase of turning and lunging toward and then away from each other. The group as a whole similarly grabbed attention with moving in a line to a whole other section of the room, all moving in individual iterations of bending and swooping limbs. 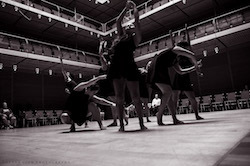 It might have been compelling to see what possibilities could have come from other line formations in the performance. It might have led to a more frenetic and rushed feeling, however. Meanwhile, the two soloists moved in compelling opposition. So much beautiful, yet simple, magic was happening, it was hard to know where to look. Such it can feel like in modern life – there’s so much excitement and possibility in front of us everyday, every minute; where are we to put our energies? The dancers individually, however, stayed present and focused in their own body, breath and continuous movement. All came together once again in a group. They found locomotive potential in their limb-driven, angular-and-circular blend of movement to exit the room in a somewhat clumped, fluid line. Their heavy, strong breath was audible as they passed (but inches away from some audience members). Hearing this brought to mind that this was one of several performances of the day. Yet there was not the slightest sign of fatigue throughout the performance. The fact of their stamina became part of the overall beauty of the work. Realizing that this gradual exit signaled the end of the performance, the audience applauded. The sound and circles of color remained in the room. Somehow, the resonance of the dancers’ movement remained there as well. 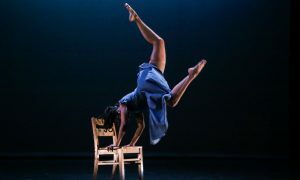 It was movement that came together with color and sound, not confined to a proscenium stage – and further freed with the possibilities of each dancer’s movement choices. 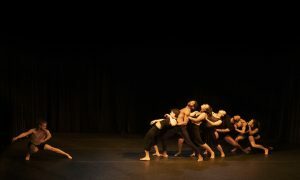 Within the structure of choreographer (and KAIROS Founder and Director) DeAnna Pellecchia’s improvisational scripts, sequencing and staging, they could allow their own individual and diverse bodies to create magic together. Each layer upon layer made it all sparkle further and deeper into viewers’ hearts and minds. With all of the challenges of the modern world, we’ve been creating and honing artistic frameworks with the openness to let this magic of convergence happen. As our art comments more specifically on those very challenges, let’s not forget how it can also celebrate the beauty that we can create, and the beauty already always around us.